The flight comes amid growing reports of a possible U.S. sale of fighters to Taiwan. 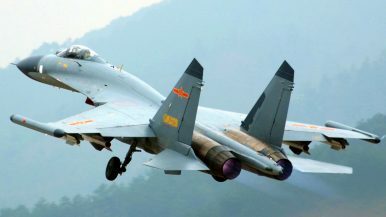 The government of Taiwan, early on Monday, pushed back at what it said was a provocative flight by Chinese People’s Liberation Army Air Force (PLAAF) Shenyang J-11 fighters across the median line in the Taiwan Strait. “At 11 a.m., March 31, 2 PLAAF J-11 jets violated the long-held tacit agreement by crossing the median line of the #Taiwan Strait,” Taiwan’s Ministry of Foreign Affairs said in a tweet. “It was an intentional, reckless & provocative action. We’ve informed regional partners & condemn #China for such behavior,” the tweet added. Chinese fighters and bombers regularly conduct flights and operations in the Taiwan Strait, but generally do not cross the median line separating the two sides. The approach across the median line on Sunday, thus, marks an unusual and provocative message in Taiwan’s view. The approach by the Chinese fighters follows reports that the Trump administration is preparing to approve a Taiwanese request for the purchase of F-16V multirole fighters. Earlier this month, Taiwanese President Tsai Ing-wen had made clear that Taipei had submitted a formal request to Washington, D.C., for the fighters. Tsai said the decision to make the request was supported by a review of Taiwan’s defense needs. Asked about the prospective arms sale, both the Chinese Ministry of Foreign Affairs and Ministry of Defense were unequivocal in clarifying China’s opposition. “China’s position to firmly oppose arms sales to Taiwan is consistent and clear,” Chinese Foreign Ministry spokesperson Geng Shuang said during a press briefing in March. “We have made stern representations to the U.S. We have urged the U.S. to fully recognize the sensitivity of this issue and the harm it will cause,” Geng added at the time. Senior Colonel Wu Qian, director general of the Information Office of China’s Ministry of National Defense (MND) and spokesperson for the MND, addressed the issue during a monthly press conference last week. “We are opposed to US’ arms sales to Taiwan and US military contacts with Taiwan,” he noted. “The Taiwan question is China’s internal affair and it concerns China’s core interests and the national bond of the Chinese people and allows no interference from the outside,” Wu added. Relations between China and Taiwan have deteriorated markedly since the 2016 inauguration of President Tsai Ing-wen, who hails from the independence-leaning Democratic Progressive Party. Though Tsai’s government has not revised Taiwan’s position on the cross-strait status quo that has prevailed now for decades, she drew Beijing’s ire when she refused to endorse the so-called “1992 consensus” that China regards as the baseline for any Taiwanese government’s acceptance of the “One China” principle. The 1979 Taiwan Relations Act, meanwhile, has governed the United States’ non-official relationship with Taipei and requires U.S. presidents to support Taiwan by providing “arms of a defensive character.” Formal U.S. diplomatic ties with Taiwan ended in 1979 when the second U.S.-China joint communiqué established formal Washington-Beijing ties. Donald Trump's phone call to Tsai Ing-wen sets up a possible diplomatic crisis with China.